I've invested over the years (via ETFs) in Singapore, Malaysia, India, Taiwan, and Hong Kong - as the "China will fix all the world's problem's" thesis plays out all these names, (along with resource based countries) have flown higher. While I believe this is how it will play out eventually (China leads) - I think this is a premature evaluation (ahem) and China can only take the rest of the world so far. If I am correct or incorrect we'll know better in about 2-3 quarters - but for now all that matters is the herd, and the herd believes it - and some of these indexes have raced to the type of gains that one would wish for over a 3 year period in under half a year [Year to Date Returns by Country, Go Peru] What has been ironic is some of these countries I follow pretty closely have posted horrific GDP figures, Singapore a month ago [Mar 26, 2009: WSJ - Signapore's Boomtown Dream Gets Hazy] and just this week Taiwan posted a scary bad GDP. Taiwan’s economy shrank an unprecedented 10.24 percent last quarter as exports fell and businesses cut spending, a decline that may mark the trough in the island’s recession... is the biggest slump since official records began in 1952. But never fear, China is here... and the markets are forward looking. One country I admit to having not looked at until the past few months is Indonesia - when I did a lot of coal research in latter 2007 Indonesia kept coming up so it was on my radar but I never dug deeper. Much like the countries above there are a dearth of US based ways to get involved in the country ... but there is an interesting opportunity here. Little known is despite being a country made up of some 17,000 islands, it is the 4th most populous on Earth. (China, India, US ahead of it) So on "demographics is destiny" alone you have a compelling situation here. What caught my eye of late is while most of the smaller Asian countries I keep an eye out on are falling by double digits in GDP - Indonesia's actually rose. Indonesia's economy grew at its slowest annual pace in five years in the first quarter, reinforcing expectations the central bank will cut interest rates again to support domestic demand. Southeast Asia's biggest economy was hit by slower investment and shrinking exports in the first quarter, but resilient private consumption and higher public spending was supportive, and some analysts said the slowdown in growth may be bottoming out. Gross domestic product rose 4.4 percent in the first quarter from a year ago, down from 5.2 percent growth in the fourth quarter of 2008. Increased spending by political parties to woo voters in an election year and fiscal spending from a stimulus package in the second quarter could help support economic growth, Sadewa added. Indonesia has managed to avoid recession during the global downturn, unlike some of its more export-reliant neighbours. Both Singapore and Hong Kong are in recession and Malaysia and Thailand are likely slipping into a recession, too, analysts say. Private consumption accounts for about two-thirds of Indonesia's GDP, helping compensate for a drop in exports of key commodities such as palm oil and nickel as global demand sputters. So unlike a lot of "Asian Tigers" - Indonesia is still focused on internal consumption over the export business. That said, it is quite rich in natural resources as well. The following content is from Joe Kunkle who runs Options Hawk, website here. His style is described as: I monitor the options market to find unusual action in the options market that leads to great trading opportunities, whether it be to takeover rumors, earnings, FDA data, or other reasons. I also provide a variety of trading ideas based on technical analysis, momentum stocks, and stocks that have a great fundamental story. 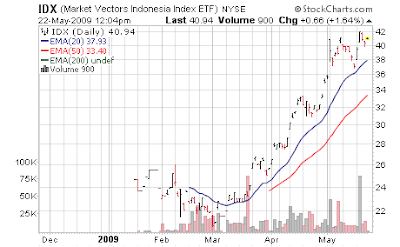 I recently came across a new offering from Market Vector Funds, the Indonesia Index (IDX), and after doing some research I began to really like the prospects with the emerging economy. Portfolios looking to diversify some holdings into an emerging market will have a tough time finding a better place to invest for the future. The IDX sector breakdown is as follows: 29% Financials, 20% Energy, 17% Materials, 12% Consumer Staples, 7% Consumer Discretionary, 6% Telecom, 6% Utility, and 3% Industrials. More than 50% of the companies are considered mid-cap, with 41.8% large cap. The PE Ratio for the fund is around 13, which is extremely cheap considering the growth prospects as compared to comparable industries in other countries. Some of the largest components in the IDX include Bumi Resources, PT Astra, Bank Central Asia, Telecom Indonesia, Perusahaan Gas Negara, Bank Madiri, and Adaro Energy. Launched in January, the IDX has climbed 60% in 5 months, but still has room to rise when considering the Indonesian economic growth prospects combined with valuation and an upcoming political event that could be a favorable catalyst for the economy (think India, which gained 17% in one day on an election win today). It was reported in the Jakarta Post, that Indonesian Presidential candidate Jusuf Kalla expects economic growth to accelerate to 8% per annum by 2011 if he wins the upcoming election, which would be competitive with the Chinese economy that is starting to slow with the rest of the World. Kalla also plans a progressive tax system and the construction of more coal-powered plants, which provides clues to individual investment ideas in Indonesia. Indonesia is rich with minerals, metals, oil and has a budding tourism industry. Indonesia is blowing away other Southeast Asian economies in GDP growth due to less reliance on exports, low interest rates and surging consumer confidence that creates the formula for an economy set to succeed for years to come. Recent agreements with Vietnam on mineral and energy ties is also bullish for the Indonesian markets. Indonesia has shown resilience and has swiftly recovered from the Southeast Asian crisis of the late 1990's through sound fiscal and monetary policies combined with rebuilding the country's infrastructure. Since 2003, Government debt as a percentage of GDP has almost been halved to around 30%, while inflation has settled in around 6%, and private investment has risen nearly 20%. The ongoing fiscal policy initiatives combined with the liberalization of the economy will make Indonesia a sound investment for years to come. Indonesia oil production has declined in recent years due to aging reserves and it formally exited OPEC in 2008, becoming an oil importer, but it ranks second in the world in liquefied natural gas exports and is less reliant on oil exports than in recent years. It also has the third largest amount of coal reserves in the world, ranks first in tin production, and has significant gold, silver, copper, and nickel deposits. With the fourth highest population in the World, around 240 million, private consumption is continuously expanding. Also, being made of 17,000+ islands makes it ideal for Agriculture, which the world will always have a need for, and it is a top exporter of palm oil (alternative fuel prospects), rubber, wood, tobacco, cocoa, coffee, tea, spices and shrimp. There are also encouraging signs of foreign investment coming in, as more favorable laws are passed, and reforms promote the investment process, as foreign direct investment jumped 150% from 2006 to 2007. The Indonesian (IDX) Fund will come with some added volatility (1.8 Beta and 36.45% annualized volatility) and may not be for the safer crowd, but offers possible huge returns, and has the lowest correlation of all economies to the developed markets that make it an attractive addition to any portfolio. I recently highlighted Indonesian Telecom (TLK) as a great investment idea for an individual stock in the region, but for traders with access to foreign markets, many of the mineral and coal plays trade at a valuation much lower than US counterparts, and offer attractive reward/risk scenarios. 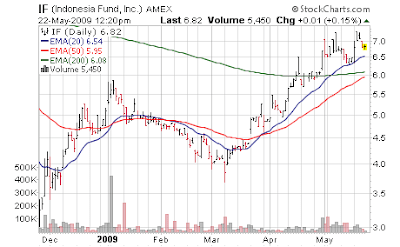 The other fund for investing in Indonesia is a closed-end fund, Indonesia Fund (IF), but I prefer the Market Vectors IDX due to a lower expense ratio, more diversification and exposure to the energy and mineral sectors, and better correlates with the return of the Indonesian equity markets. The IF has 20.29% of its fund concentrated in Indonesia Telecom (TLK) and 12.43% in Bank of Central Asia, with a total of 70.18% of its holdings concentrated in the Top 10 Holdings, while the IDX has 25 constituents with only 60% of its holdings concentrated in the Top 10 Holdings. The sector breakdown of the IF is as follows: 24.75% in Financials, 24.54% in Telecom, 16.8% in Consumer Goods, 9.71% in Basic Materials, 6.46% in Industrials, 5.98% in Utilities, and 11.77% Other. Therefore the IDX is much more focused on Energy and Commodities which are rallying globally as the US Dollar falls and inflation signals begin to sound.